Riduan Isamuddin also transliterated as Riduan Isamudin, Riduan Isomuddin, and Riduan Isomudin, better known by the nom de guerre Hambali, born as Encep Nurjaman (born April 4, 1964) is the former military leader of the Indonesian terrorist organization Jemaah Islamiyah (JI), which is linked with al-Qaeda. He is now in extrajudicial detention in the United States's Guantanamo Bay detainment camps, in Cuba. Hambali was often described as "the Osama bin Laden of Southeast Asia". Some media reports describe him as bin Laden's lieutenant for Southeast Asian operations. Other reports describe him as an independent peer. He was highly trusted by al-Qaeda and was the main link between the two organisations. Hambali was a close friend of Khalid Sheikh Mohammed, who planned Operation Bojinka and the September 11 Terrorist Attacks. Hambali envisioned creating a Muslim state, in the form of an Islamic superpower (a theocracy) across Southeast Asia, with himself as its leader (Caliph). His ambition was to rule Indonesia, Malaysia, Singapore, Brunei and parts of the Philippines, Myanmar, and Thailand. He received increasing attention in the aftermath of the 2002 Bali nightclub bombing, in which 202 people died. He was eventually apprehended in a joint operation by the CIA and Thai police in 2003. He is currently imprisoned in Guantanamo Bay detention center in Cuba, after three years of CIA custody in a secret location. Riduan Isamuddin was born Encep Nurjaman in the rice belt of Sukamanah, a small village in Cianjur Regency, in the province of West Java, Indonesia. He was the son of a peasant farmer, and was the second of thirteen children. He first became involved with Jemaah Islamiah as a teenager. He was a diligent student at his Islamic high school, Al-Ianah. He travelled to Afghanistan in 1983 to fight the Soviet Union during the Soviet invasion of Afghanistan. During his three years as a mujahid, from 1987 to 1990, he met Osama bin Laden. Friends and family in Indonesia say they did not know of his activities overseas. His name was spelled Hambali, Riduan bin Isomuddin on the Summary of Evidence memo prepared for his Combatant Status Review. His name was spelled Ryuduan bin Isomuddin by Scott McClellan during a press briefing. McClellan spelled his name letter by letter. His name is spelled Riduan Isamuddin in the report of the 9-11 Commission. His name was spelled Nurjaman Riduan Isamuddin by the US Treasury. In 1991, Nurjamin returned to Cianjur for one week, before going to Malaysia, where he met the two co-founders of JI, Abdullah Sungkar and Abubakar Bashir. The three lived in a housing compound in Kampung Sungai Manggis, Banting, Selangor. Nurjaman internationalized the terrorist group's activities and took on a new name in his permanent residence permit: Riduan Isamuddin. His nickname, Hambali, is an allusion to Hanbali, an Islamic school of jurisprudence. The two co-founders sent their students to "study" in Afghanistan and Pakistan. The students actually fought the Soviets until the Soviets pulled out of Afghanistan. A woman named Noralwizah Lee Abdullah had gone to Malaysia for religious schooling. She secretly married Isamuddin after meeting him at the Luqmanul Hakiem School in Ulu Tiram, Johor. The school was founded by Sungkar and Bashir. Initially, Isamuddin struggled to make a living for his family. He switched from selling kebabs to patenting medicines. He soon disappeared from his home for weeks at a time, and he received many visitors at home. He eventually came to own a red hatchback and several cell phones. Investigators say that many calls on those cell phones were made to Mohammed Jamal Khalifa, Osama bin Laden's brother in law, who had arrived back in Manila, Philippines in 1991. After Arab visitors gave his family lots of money, he founded a shell company, Konsojaya, in June 1994. Ostensibly an import-export company trading in palm oil between Malaysia and Afghanistan, it was essentially a front company for terrorism. Wali Khan Amin Shah, who would become the financier of Operation Bojinka, was a director of Konsojaya. The company provided financial assistance to the project until it was discovered by investigators on a laptop computer after an apartment fire on January 6, 1995. Shah was arrested in the Philippines but escaped on a short order. Shah was arrested in Malaysia in December 1995. Both Shah and mastermind Ramzi Yousef, who escaped the Philippines but was arrested in Lahore, Pakistan, were extradited to the United States. They were both convicted and sentenced to life in prison for participating in the project. Hambali's company attracted attention of investigators so his dealings went quiet for a while. He decided to preach, raise money, and recruit for his cause. He went underground in 2000 and started a wave of church-bombings in Indonesia. He always had a "hands-on" technique; he met his foot soldiers and came to them "with detailed plans, plenty of cash and two of his own bombmakers." He always fled before the bombing commenced. Meanwhile, the spiritual leader of Jemaah Islamiah, Abu Bakr Bashir, was preaching jihad at his schools while denying links to Islamic militants. Hambali planned and attended the January 2000 Al Qaeda Summit in Kuala Lumpur, Malaysia. Among the others present were two September 11 hijackers, Khalid al-Mihdhar and Nawaf al-Hazmi. This gathering in Kuala Lumpur was observed by the CIA and Malaysian authorities, but what specifically was being said at the meetings was not picked up. Hambali also provided money and documents to Zacarias Moussaoui in October of that year. However claims by Singaporean security analyst Rohan Gunaratna that he had flown to Australia were dismissed by Australian authorities. After the Bali nightclub bombing, in which 202 people were killed, Hambali received more attention from the United States. In the years leading up to the attack, the Indonesian government's action against Islamic militants had been minimal. Following the attack, Abu Bakr Bashir was arrested as part of a crack down on Jemaah Islamiah. He was wanted in Indonesia for the bombings of several churches in the region, and wanted for the Bali bombing and a failed plot on several targets in Singapore. Hambali used a series of safe-houses throughout Southeast Asia, especially Thailand and Cambodia, to move around. While he was in Ayutthaya, Thailand, 75 kilometers north of Bangkok, he was planning a terrorist attack against several Thai hotels and the Asia Pacific Economic Cooperation summit (APEC) in Bangkok on October 2003. Hambali had used a false Spanish passport to enter Thailand while his wife used her Malaysian passport. Thai police found him as part of a joint operation between the Thai police and the CIA on August 11, 2003. The twenty uniformed and undercover police smashed down the door to his one bedroom apartment in Ayutthaya, and arrested him and 33-year-old Noralwizah Lee Abdullah, a Chinese Malaysian who was considered to be his wife. Hambali was wearing a pair of jeans, a T-shirt, a baseball cap, and a pair of sunglasses. Police also seized explosives and firearms in the property. It marked the end of a 20-month hunt for Hambali, who was 37 years of age when he was captured. A 2006 Human Rights Watch report stated that Hambali was imprisoned in Jordan for the account of the CIA. 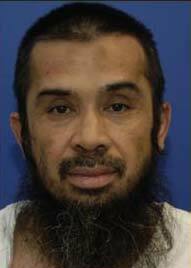 On September 6, 2006, President George W. Bush confirmed that Hambali had been held by the CIA and revealed that he had been transferred to Guantanamo Bay. His wife is now in Malaysian custody. On September 8, 2006, Indonesia formally requested access to Hambali to ensure a fair trial. The United States are reluctant to hand him over because of the lenient sentence Indonesia imposed on Bashir. Hambali is also wanted in the Philippines for the transfer of explosives on Filipino soil in an attempt to transport them to Singapore. Following his capture the USA would not confirm or deny that he was in their custody. But on September 6, 2006, President George W. Bush acknowledged the existence of covert, overseas CIA interrogation centres (colloquially known as black sites) and announced that 14 high-profile members (al Qaeda and other related groups) had been transported from those sites to Guantanamo Bay. Those 14 include Hambali and an alleged lieutenant of his called Mohammed Nazir Bin Lep alias Lillie or Li-Li. Following his capture, on August 11, 2003, the United States government subjected Hambali to almost three years of isolation, interrogation and torture. Within days of his arrest, he was taken to an undisclosed secret detention facility where he was subject to "enhanced interrogation techniques" (EITs) inflicted by the Central Intelligence Agency (CIA) for approximately three years as part of the notorious Rendition, Detention and Interrogation (RDI) program, which is now commonly known as the "Torture Program." But a complete description of his torture as well as the locations in which it occurred remained classified by the United States government. Only limited amounts of information describing his torture have been released - first from the International Committee of the Red Cross Report on the Treatment of Fourteen 'High-Value Detainees' in CIA Custody dated February 2007 and later by the SSCI Report in 2014. To this day, the United States government continues to conceal Hambali, incommunicado, within a secret prison, Camp 7, for the primary purpose of concealing the crimes of torture committed against him by the Central Intelligence Agency and its subcontractors. The United States government refuses to acknowledge the torture it committed or provide to Hambali's counsel or family information related to his current medical condition and it refuses to provide adequate treatment to him for the effects of the torture committed against him. According to the 2014 Senate Intelligence Committee report, Hambali was told by an interrogator that he would never go to court: "We can never let the world know what I have done to you." And today, this remains the case, as the United States continues to suppress and classify the details of the torture committed as part of the RDI program. From the SSCI Report and the ICRC Report of 2007, the public knows that Hambali was subject to various methods of torture including prolonged periods of hanging. The torture of Hambali was overseen and supervised, in part, by medical professionals including ethically deviant physicians and psychologists that were procured and funded by the C.I.A.. In both cases, the purpose of providing complicit medical professionals was not to alleviate the effects of this torture but to facilitate the gathering of intelligence. According to the ICRC report, a medical professional who was monitoring Hambali's torture told him, "I look after your body only because we need you for information." Riduan Isamuddin was among the 60% of prisoners who chose to participate in tribunal hearings. A Summary of Evidence memo was prepared for the tribunal of each detainee, listing the allegations that supported their detention as an "enemy combatant". According to Xinhua, the Department of Justice was considering transferring Riduan Isamuddin to Washington, D.C. for a civilian trial. When he assumed office in January 2009, President Barack Obama made a number of promises about the future of Guantanamo. He promised the use of torture would cease at the camp. He promised to institute a new review system. That new review system was composed of officials from six departments, where the OARDEC reviews were conducted entirely by the Department of Defense. When it reported back, a year later, the Joint Review Task Force classified some individuals as too dangerous to be transferred from Guantanamo, even though there was no evidence to justify laying charges against them. On April 9, 2013, that document was made public after a Freedom of Information Act request. Riduan Isamuddin was one of the 71 individuals deemed too innocent to charge, but too dangerous to release. Although Obama promised that those deemed too innocent to charge, but too dangerous to release would start to receive reviews from a Periodic Review Board less than a quarter of men have received a review. Some of the above information about Hambali, and more, can be read in the report of the 9-11 Commission. Modernine TV discussed Hambali on TimeLine, 30 December 2018, in "Black Magic Operations". ^ Vicini, James (March 11, 2010). "Guantanamo prisoner known as Hambali seeks release". Reuters. Archived from the original on 2015-09-24. Retrieved 2017-07-01. ^ Maria Ressa (August 29, 2002). "The quest for SE Asia's Islamic 'super' state". CNN. Archived from the original on 2008-03-29. Retrieved 2008-03-30. The main financier of the operation is alleged to have been Riduan Isamuddin, also known as Hambali, and now purported to be al Qaeda's main operative in Southeast Asia. ^ "'We will fight until we run out of blood'". Melbourne: The Age. October 15, 2002. Archived from the original on 2008-04-05. Retrieved 2008-03-30. In Malaysia, Bashir began to surround himself with a hard-core of militants. One of these was Hambali, alias Riduan Isamuddin, a 37-year-old Indonesian who fought against the Soviets. Today, he is described by Western sources as the chief operations officer of JI, and is reputedly the mastermind of al Qaeda cells in this part of the world. ^ OARDEC (February 9, 2007). "Summary of Evidence for Combatant Status Review Tribunal - Hambali, Riduan bin Isomuddin" (PDF). Department of Defense. Archived (PDF) from the original on 2007-06-14. Retrieved April 13, 2007. ^ Scott McClellan (August 14, 2003). "Press Gaggle by Scott McClellan and a Senior Administration Official Aboard Air Force One". White House. Archived from the original on 2011-07-28. Retrieved April 13, 2007. ^ a b "The 9/11 Commission Report" (PDF). 9-11 Commission. Archived (PDF) from the original on 2016-10-19. Retrieved April 14, 2007. ^ "Treasury Designates Four Leaders of Terrorist Group "Jemaah Islamiyah"". US Treasury. April 13, 2006. Archived from the original on 2007-04-14. Retrieved April 13, 2007. ^ Small, David (24 August 2004). "Terrorism Expertise of Rohan Gunaratna Questioned". Scoop. Archived from the original on 2017-03-18. Retrieved 17 March 2017. ^ "Hunt for Hambali - the Osama of the Far East". Sydney Morning Herald. 16 October 2002. Archived from the original on 2008-01-09. Retrieved 2008-03-01. ^ "Bush admits to CIA secret prisons". BBC News. 2006-09-07. Archived from the original on 2006-10-05. Retrieved 2006-09-08. ^ "Jakarta seeks access to Hambali". BBC News. 2006-09-08. Archived from the original on 2007-03-27. Retrieved 2006-09-08. ^ Bush: CIA holds terror suspects in secret prisons Archived 2008-05-16 at the Wayback Machine, CNN, 7 September 2006. ^ a b c d Peter Lloyd (2014-12-10). "US Senate report, declassified cables question results of CIA's interrogation of Hambali". Australian Broadcasting Corporation. Archived from the original on 2017-06-28. Retrieved 2018-06-28. Top secret cables, now declassified, revealed the torture of Hambali began one month after his capture. ^ a b c d Paul Farrell (2014-12-10). "US Senate rejects CIA claims torture was key to capture of Bali bombings suspect". The Guardian. Archived from the original on 2018-06-29. Retrieved 2018-06-28. Hambali was one of eight key examples given by the agency to justify the success of "enhanced interrogation" techniques. ^ a b c d Alistair Bell (2014-12-11). "Did torture really help U.S. find al Qaeda chief Hambali?". Reuters. Washington, DC. Archived from the original on 2018-06-29. Retrieved 2018-06-28. ^ a b c d "RIDUAN ISAMUDDIN (HAMBALI)". The Rendition Project. Archived from the original on 2018-06-29. Retrieved 2018-06-28. It was at this point that Hambali entered CIA custody, and was, according to CIA records cited by the SSCI report, almost immediately subjected to "enhanced interrogation techniques". There are no declassified records detailing the torture of Hambali, although there are cables recording the fact that he later recanted the information he provided under torture, which he gave "in an attempt to reduce the pressure on himself... and to give an account that was consistent with what he assessed the questioners wanted to hear." ^ Executive Summary, Findings and Conclusions, and Foreword by Senate Select Committee on Intelligence (SSCI) Chairman Dianne Feinstein, of the Senate Select Committee on Intelligence's study of the Central Intelligence Agency's Detention and Interrogation Program, released on or about December of 2014 (SSCI "Torture Report") at xiii. ^ See ICRC Report at paragraph 3. ^ Elsea, Jennifer K. (July 20, 2005). "Detainees at Guantanamo Bay: Report for Congress" (PDF). Congressional Research Service. Retrieved 2007-11-10. ^ OARDEC (April 4, 2007). "Combatant Status Review Tribunal, transcript 10017" (PDF). Department of Defense. Archived (PDF) from the original on 2007-06-14. Retrieved April 13, 2007. ^ "U.S. may bring key Guantanamo detainee to Washington for trials: officials". Xinhua. 2010-01-16. Archived from the original on 2010-02-11. ^ สํานักข่าวไทย TNAMCOT (30 December 2018). "ข่าวดังข้ามเวลา ตอน "Black Magic Operations ปฏิบัติการลับจับฮัมบาลี" [คลิปเต็มรายการ]" – via YouTube.